Learning calligraphy at the Oshogatsu workshop at JACCC. 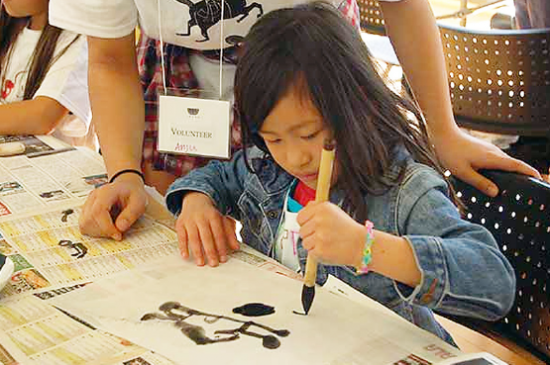 Enjoy a one-day workshop while learning about the symbols and festivities surrounding Oshogatsu or Japanese New Year on Monday, Dec. 29, from 10 a.m. to 3 p.m. at the Japanese American Cultural and Community Center, 244 S. San Pedro St., Little Tokyo. The fun, hands-on educational program will include craft activities, games and demonstrations by local artists. This year’s program includes a taiko workshop by Johnny Mori, a traditional Japanese fine arts workshop by Hirokazu Kosaka, and mochitsuki by Kodama Taiko. For more information or to register, call (213) 628-2725 or visit www.jaccc.org. Register early to reserve your child’s spot. For children ages 7 to 12. Limited to 30 participants, reservations required. Tickets: $30 general, $25 JACCC members. To register, call (213) 628-2725, ext. 133. For additional information on JACCC programs, call the box office at (213) 680-3700 or visit the website.